There are some simple pleasures in life that just make us ridiculously happy – and flying a kite is one of them. Whether you’re young, old, or unwilling to accept your age, everyone can make their own kite and have the time of their lives. But many people are often put off by the idea of making a kite, and decide to buy one instead. However, making your own kite is so satisfying and will make the experience even more enjoyable. Trust us. 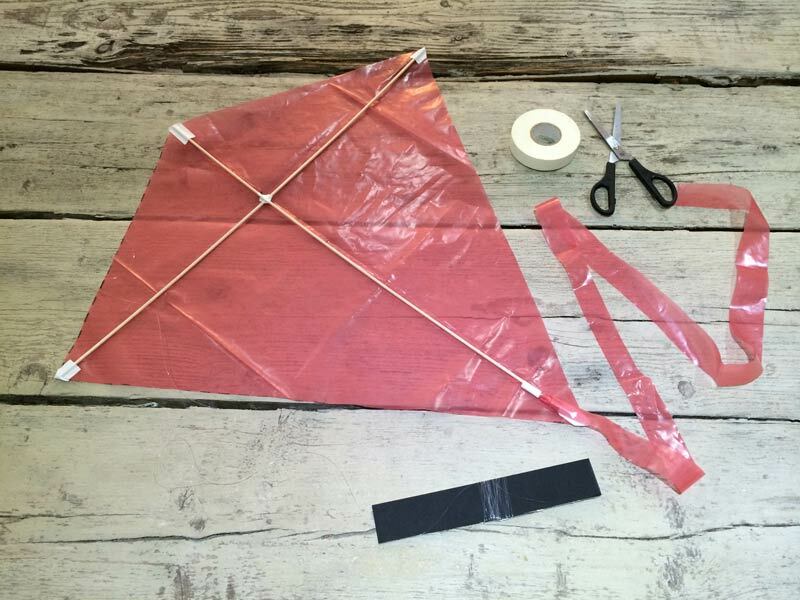 To start making your epic homemade kite, you’ll need a few supplies. These are: a thick plastic bag (whatever color you’d like your kite to be), a full roll of your standard electrical tape (again, whatever color you’d like but make sure the colors don’t clash! 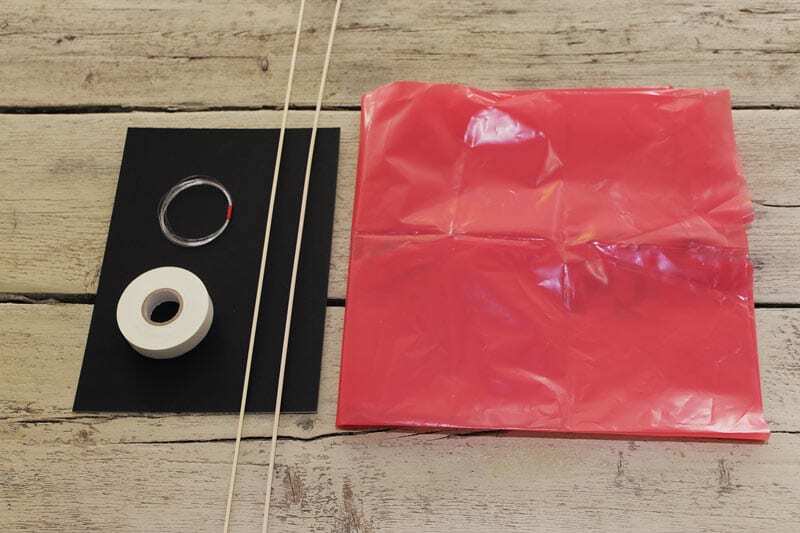 ), two 5 mm hardwood dowels, a roll of thin nylon fishing line, and a piece of cardboard or a small bit of wood for the kite winder. 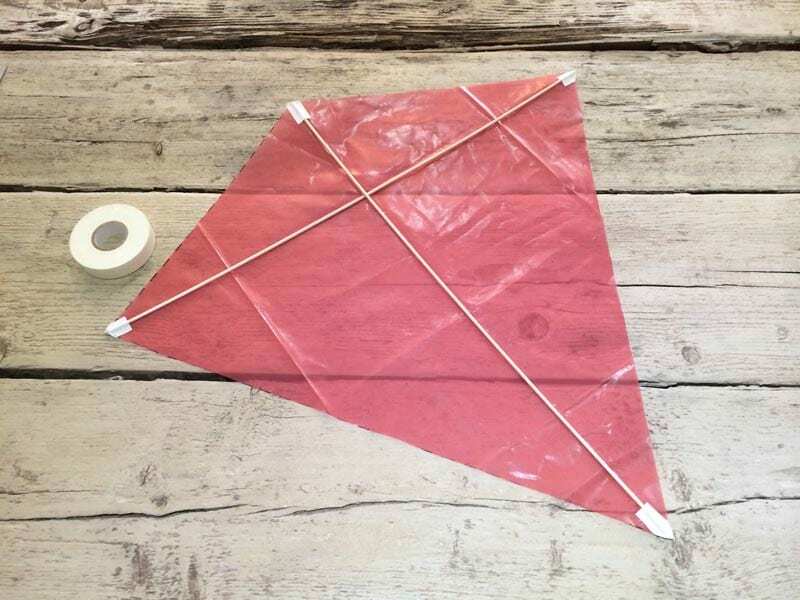 All of the tools you’ll need to make your own kite can be found around your house, so you don’t need to worry about taking a trip to the store! 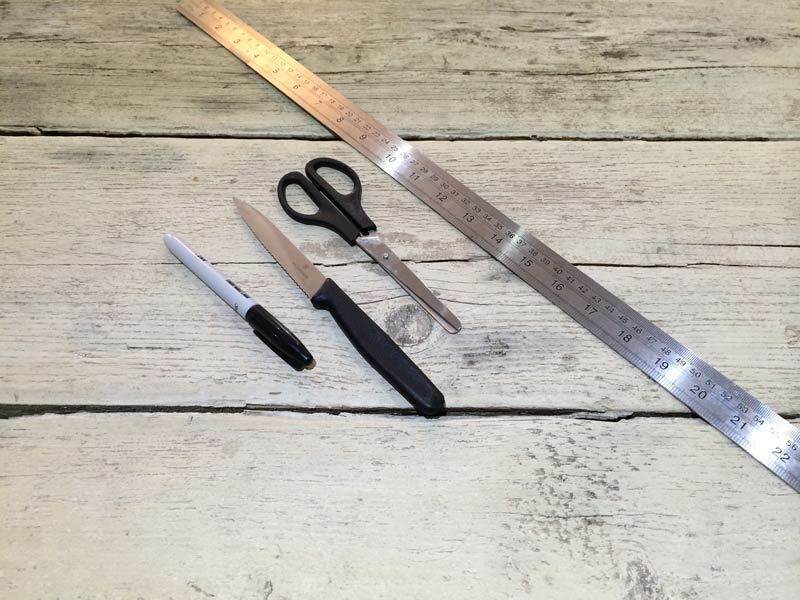 You’ll need: scissors, a carving knife (always keep this away from any children), a standard ruler, and a black permanent marker pen or Sharpie. 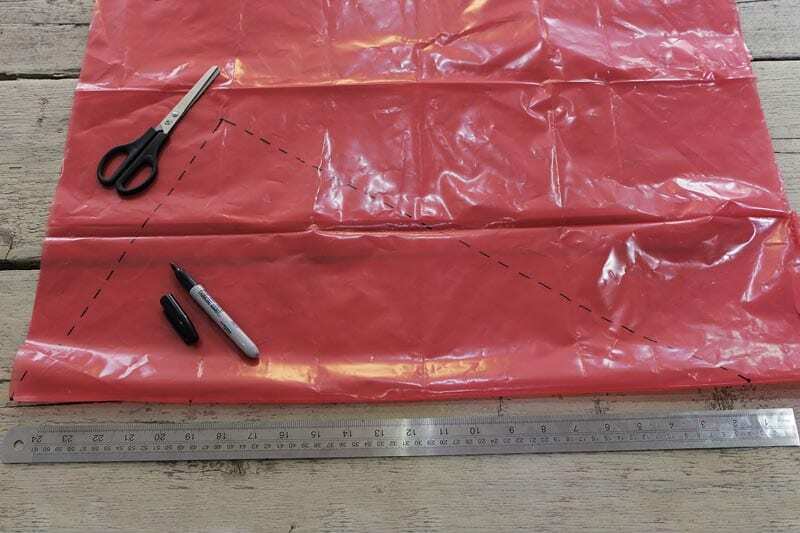 The first step in making your own kite sail is to lay a thick plastic bag onto the table, with the bag opening laying at the bottom. You’ll then need to use your marker pen to mark three dots onto your bag – the first will be on the bottom left edge,the next 100cm to the right of the first dot, and the last dot 50 cm away from the left edge, and 25 cm from the top of the bag. Connect all of the dots using your ruler and pen, to form a triangle as shown above. 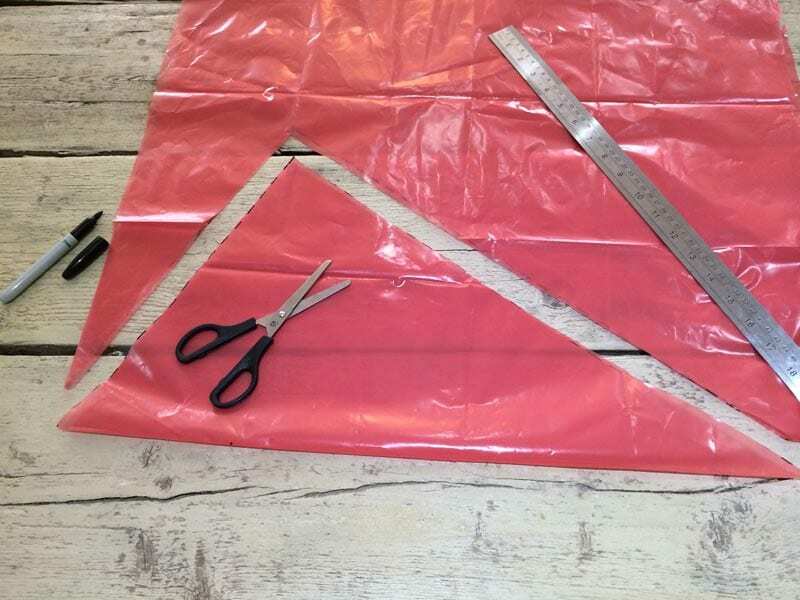 Next, follow the lines of the triangle and cut it out using the scissors provided. Always get an adult to do this to prevent any accidents, and keep the bag scraps for later. Unfold your triangle to form the diamond shape of your kite and lay it flat on the table or a flat surface. Take one of your wooden dowel sticks and lay it from the tip of the kite to the bottom, and cut accordingly. Now, take a 5 cm piece of your electrical tape and secure the dowel. Take the second dowel and repeat horizontally so the dowels cross over each other. Next, turn over your (already awesome looking) kite and poke a hole in the sail through to the other side, in the spot where the two dowel sticks cross. X marks the spot! Grab your fishing line and thread one end into the hole, tying it to both of the wooden dowels so that it is secure. For extra security, take some more of the security tape and place it over the cross. With the other end of the fishing line, tie it to your small piece of wood or cardboard – but remember, this is something you are going to be holding a lot, so make sure it’s comfortable! No kite is complete without a tail to fly in the wind. 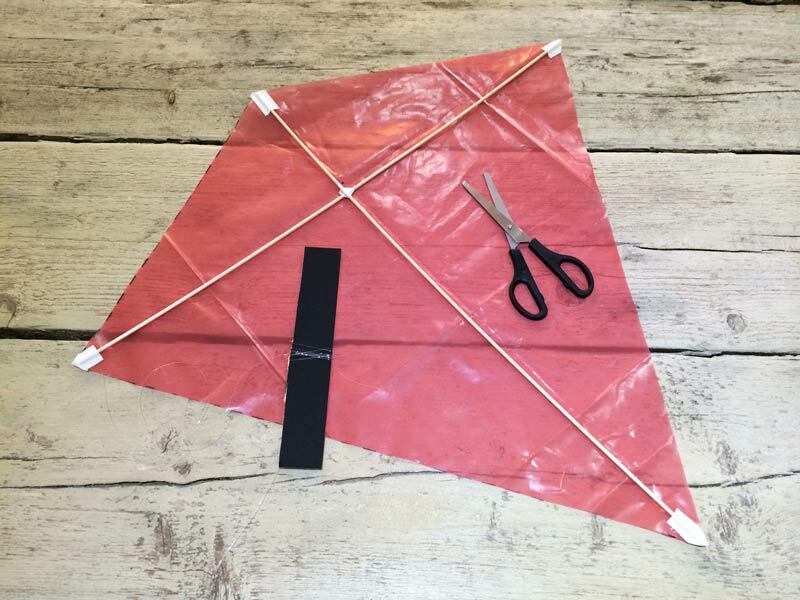 To make this, cut a length of your plastic bag around 5 cm wide and twice the length of your kite (or to your preference). Tie the tail to the bottom of your vertical dowel and attach with more tape. Now you’re ready to fly your kite!